First MQ was not really happy about my attempt to install this work there and now MA36 and the police department for weapon and event issues don´t allow the projection of “POTENTIAL TERRORIST” onto the people. Because of the danger, that i could harm the mental health of the people. But my attempt is to raise the attention of the possible dangers we all are facing, i don´t wanna endanger anybody. But i didn´t give up and so they just disarmed my concept. I guess i have to mention them in the credits of my work. But which function: co-authors or censors ? 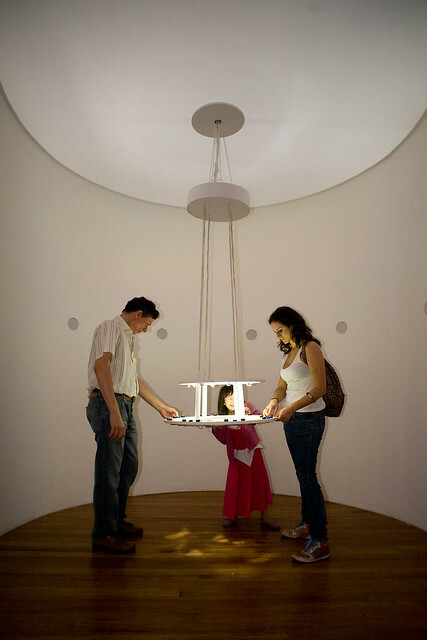 as long the person moves within the interaction radius of the installation. > “IMMACULATE” is briefly projected onto the torso of the person and then disappears. Since the attacks on the World Trade Center the international safety regulations tighten and the fear of terrorism is spreading. But the preventive measures taken under the pretext of security and the war against terrorism are about to constrain fundamental rights and the freedom of people. The recently enacted data retention in Austria or the article § 278a, known as the mafia article are these kind of arrangements to prevent terrorism. The recent trial about the animal rights activists in austria is a good example of the misuse of this measures. These methods are based on the potential threat by every individual person, who therefore becomes a potential terrorist. There is a broad agreement about taking actions against terrorism, but not everybody is aware of the downsides, like the restraints of their freedom. POTENTIAL TERRORIST wants to raise the conscious awareness about these possible dangers. Since the software has no built-in recognition of specific personal characteristics each person is treated equally and only a random process determines whether someone is a POTENTIAL TERRORIST, or not. The selected person moves into focus of attention and has to question himself, how such an accusation can happen and on which facts it is based. The infrared camera captures the entire area that is illuminated by infrared lights and sends the image to a software that analyzes and detects any movement on the court. If a person is identified, its position coordinates are analyzed and transformed into the data to navigate the projection. At the same time the software generates the visual information that is displayed on the video projector. All technology is installed at the same height and position as the widely used surveillance cameras. the exhibition is realized in cooperation with quartier21 and Coded Cultures Festival. bleibt „haften“ solange sich die Person innerhalb des Interaktionsradius der Installation bewegt. > „IMMACULATE“ wird kurz auf den Oberkörper der Person projiziert und erlischt wieder. Seit den Anschlägen auf das World Trade Center 9/11 wurden die internationalen Sicherheitsbestimmungen verschärft und die Angst vor dem Terrorismus breitete sich aus. Unter dem Vorwand der Sicherheit schränken die Präventivmassnahmen der Terrorbekämpfung immer mehr die Grundrechte und Freiheit der Menschen ein. Die in Österreich vor kurzem beschlossene Vorratsdatenspeicherung oder der als Mafia-Paragraf bekannte §278a sind solche Massnahmen die unter dem Deckmantel des Kampfes gegen den Terrorismus gerechtfertigt werden. Dass solche Massnahmen jedoch leider oft missbräuchlich und ungerechtfertigt eingesetzt werden, zeigte der in Österreich laufende Tierschutzprozess. Jedoch sind Vorratsdatenspeicherung und Mafia-Paragrafen nur ein Teil der gesamten Massnahmen internationaler Terrorbekämpfung, zu denen weiters das sammeln biometrischer Daten, Gesichtserkennung, RFID, Rasterfahndung, Nacktscanner, usw. zählen. Diese Methoden gehen grundsätzlich von der möglichen Bedrohung jedes Einzelnen aus. Jeder Mensch wird dadurch zum potentiellen Terroristen. Auch wenn sich alle darüber einig sind, dass gegen Terrorismus vorgegangen werden muss, wissen die wenigsten über die Gefahren, die die erforderlichen Mitteln für jeden Einzelnen darstellen, bescheid. Die Arbeit POTENTIAL TERRORIST möchte diese Tatsache ins Bewusstsein der Menschen rufen und auf mögliche Gefahren hinweisen. Da die Software keine Erkennung von personenspezifischen Merkmalen eingebaut hat, wird jede Person gleich behandelt und nur der Zufall entscheidet ob jemand ein POTENTIAL TERRORIST ist, oder nicht. Dadurch rückt die ausgewählte Person in den Fokus der Aufmerksamkeit und muss selbst hinterfragen, wie eine solche Anschuldigung zustande kommen kann und auf welchen Grundlagen diese aufbaut. Die Infrarotkamera erfasst die gesamte Interaktionsfläche, die durch den Infrarotscheinwerfer ausgeleuchtet ist und sendet das Bild an eine Software, die es analysiert und jede Bewegung am Platz erkennt. Wird dabei eine Person identifiziert, werden ihre Positionskoordinaten von einer Software ausgewertet und die visuelle Information mittels Videoprojektion auf das Geschehen projiziert. Die gesamte Technik ist auf gleicher Höhe und Position wie die weit verbreiteten Überwachungskameras, die mittlerweile jeden öffentlichen Platz überwachen, installiert. Die Ausstellung wurde realisiert in Kooperation mit dem quartier21 und dem Coded Cultures Festival. Check out a short videodocu from the exhibition at this years FILE Festival. I am happy to announce two international invitations with my hyperactive installation “skia” this summer. A special great pleasure is the invitation to the Theatrefestival Varna in Bulgaria beginning of June ! To be invited at a theatrefestival is something special for me as i am very interested in new media connected with stage performances like theatre. I am very much looking forward to this festival and the acts i am going to see, the artists i gonna meet and of course the beautiful city i will visit ! The other invitation is at the FILE Festival in Sao Paulo, Brazil which is one of the biggest mediaart festivals worldwide. I already participated last year with my work disc. and also looking forward to see this years program and all the interesting works and artists there. disc. was invited to rock FILE Festival this summer ! FILE Festival is one of the biggest electronic art Festivals worldwide and so it was a great honour to participate ! I took the chance to spend some time in brazil to explore the country, but when i wanted to leave and take my disc. with me – FILE Festival didnt let me and they kept it for the next edition of FILE in Rio de Janeiro in October. I was very pleased already with the exhibition space in Sao Paulo, but in Rio they did some extra nice work by hiding the speakers behind the wall ! Pretty fancy ! I recently exhibited my hyperactive installation “skia” at the National Academy of Arts in Sofia at the second edition of the Digital Art Festival. Check out an image from the presentation at the Zollamtstrasse. currently i am working on my diploma project called “skia“, which i will present on 16.6. So selbstverständlich wie uns täglich die Sonne leuchtet nehmen wir auch den eigenen Schatten als ständigen Begleiter kaum mehr wahr. Als reine Projektion unseres physischen Abbilds ist er nicht mehr als eine flache, farb- und körperlose Reduktion unserer Selbst. Die Rauminstallation “skia” untersucht dieses eigenschaftslose Phänomen und spielt mit der Konvention von dessen Wahrnehmung. In einer Closed-circuit-Installation werden die Abbilder der BesucherInnen manipuliert und als künstliche Schatten wiedergegeben. Was bedeutet es, wenn sich plötzlich der eigene Schatten von uns löst und ein fremdes Wesen entwickelt ? Und was hat ein solch rätselhafter, launischer Schatten mit den multiplen Identitäten des postmodernen Ichs gemeinsam ? As natural as the daily sunshine, one’s shadow, formerly a constant companion, now often escapes from attention. A silhouette of our physical form, one’s shadow is no more than a flat, disembodied reduction of the contours of one’s self. The installation skia examines the interplay of our shadows and our conscious awareness of our physical displacement of space. In this closed-circuit installation, visitor´s images are manipulated and projected as artificial shadows. What does it mean if one’s shadow suddenly frees itself and develops an alien autonomy? And what has such an estrangement in common with the multiple identities of the post modern ego?